Umm I must start choosing plants with shorter names for my plant of the week, however the length of the name, each Plant of the week is selected on merit and Sarcococca ruscifolia var. chinensis ‘Dragon Gate’ is certainly here for that reason! Sarcococca ruscifolia var. chinensis ‘Dragon Gate’ is a highly scented winter flowering shrub. It’s flowers can be scented many metres away from the plant and it’s always fun watching people searching for the source of the scent and being shocked when they find it’s coming from this shrub with tiny flowers. Sarcococca ruscifolia var. chinensis ‘Dragon Gate’ is a mouthful of a name but Sarcococca comes from the Greek works sarkos meaning flesh and kokkos meaning berry, really after the fleshy berries on the plant. Ruscifolia means Ruscus like leaves and chinensis means Chinese from the country of origin. This Chinese form of the winter box was discovered by the great Roy Lancaster in 1980, outside a Chinese temple in the Yuccan area of China. This form is a compact form of Sarcococcca, growing to 0.6×0.6m wide shrub after 5yrs. The small but highly scented flowers are borne on the stems often at times, with the red/blue/black berries from last years flowers. These flowers are barely 5-10mm big and are open from mid December through to March time. The dark green glossy leaves are quite small even for a Sarcococco. It will grow quite happily in full sun, partial shade and deep shade. It is happy to grow in most soils as long as it’s not too waterlogged. It is a tough plant that isn’t effected by too many pests, as it’s a member of the Buxus family, it can suffer with box blight which is the worse It’s also pretty deer resistant. 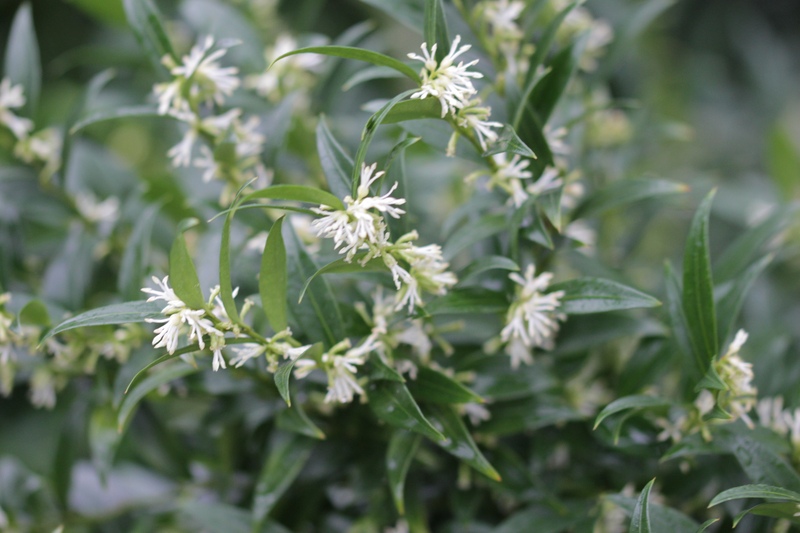 Like all Sarcococca, it can be trimmed after flowering to keep a more compact shape. Once it’s finished flowering again I give it a light feed of Vitax Q4. Ahh this could fit in quite nicely, any dark shady spot near the house? I have a few sarcococca too Thomas and they are such fabulous plants. Can you tell me if bonemeal or FBB would be a good feed too as I don’t usually buy Vitax Q4. Is it especially good? Thankyou. I love how we can get good practical advice from fellow gardeners on this forum. I have not seen that one before, but then sarcococca is usually a plant that is smelled but not seen. Of course, the flowers of the common sort are not as prominent as they are on this cultivar. I just happened to see some of the common sarcococca today that were some of the biggest I have ever seen. They typically do not do well here. Yes some get to a massive size can’t they, always surprising to see how big they get 😀 I think they need a little bit of a cooler environment to grow well, maybe in the mountains? That happens to be where I see them doing well. I saw the big ones today in Mount Hermon. It is not a high elevation, but has a similar climate to higher in the Santa Cruz Mountains. In the Santa Clara Valley, they are always quite runty. It is nice. It is why the film industry started in Niles and then moved to the Hollywood area. We have such diversity in climate and terrain, and everything. We have more climates in Santa Cruz or Santa Clara Counties than the entire states of Kansas, Oklahoma, Nebraska or a few others. The problem is that I can not grow what I grew in the Santa Clara Valley here in the Santa Cruz Mountains, just a few miles away.